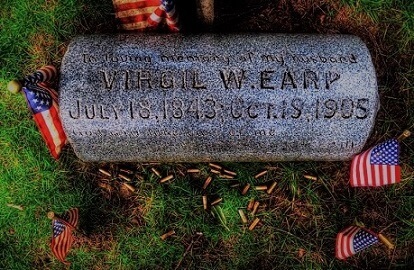 Virgil Earp - Was He the Most Likable and Honorable Earp Brother? Virgil Earp was the second child of Nicholas and Virginia Ann (Cooksey) Earp. He was born on July 18, 1843 in Hartford Kentucky. Named as Virgil Walter Earp. The family moved to Monmouth, Illinois. Then to Pella Iowa in 1850, when Virgil was 7 years old. That's really where he spent his childhood. There his father had the family farm. Despite the objections, they stayed together. On January 7, 1862 they had a newborn baby girl.3 She was named Nellie Jane. The American Civil War began on April 12, 1861. Virgil's father Nicholas viewed himself a Southern man. Yet he was against slavery and didn't believe in Southern states' secession. He joined up to serve as U.S. Provost Marshall for the Union. He found local recruits and drilled them for service. Naturally his eligible sons would be considered. Virgil enlisted with the Union Army. He'd had to wait until he was 18 years of age. His older brothers Newton and James had already enlisted. Thus he left his young family to serve the Northern cause. His daughter was just an infant of 7 1/2 months old. Virgil left for the Illinois Volunteer Infantry on September 21, 1862. He had a 3-year commitment. The roll described Virgil Earp's height as 5 foot, 10 inches. It went on to say he had fair skin and hair, with blue eyes. His job was listed as a farmer. Interestingly he was called unmarried.7 He was with a company predominantly stationed in Tennessee. Virgil's service didn't mark him as heroic or anything special. His rank stayed the same, as a Private. During Virgil Earp's time in the war, word reached home. 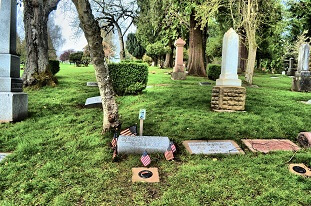 About midway in his service some said he'd been injured and killed. When Ellen received this notification, she believed she was now a war widow. She likely felt it would be difficult on her own, with a child. It's felt her father, along with Virgil's father, approved of her believing this rumor. Virgil Earp, alive and well, received his army discharge on June 26, 1865. He went back to Pella Iowa to return to his wife and child. But he found they were no longer there. He probably heard why they left, and he didn't pursue them. The Earps had also left, trekking by wagon train to San Bernardino California in 1864. 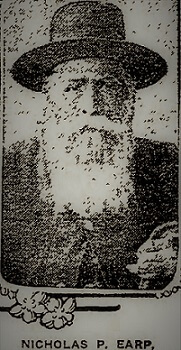 Father Nicholas Earp rented a farm there on the Santa Ana River. Virgil drove the stagecoach. He taught 17-year-old Wyatt the ropes of the business, as a "swamper" - a helper. Wyatt rode the shot-gun seat, helped with loads, and gave Virgil a break in driving. They went on a route to Los Angeles, to Prescott AZ, and sometimes to Salt Lake City.7 Some time after that they went to Wyoming to work on building the railroad. At some point Virgil and Wyatt went their separate ways. Wyatt continued on with his own adventures. Virgil decided to go back to Pella Iowa. Virgil stayed in Pella awhile, working at a few jobs. Virgil's father had moved the family again in 1868. Farming was not working out, as none of the sons were interested in that line of work. Nicholas moved the family to Lamar Missouri. Virgil Earp decided to rejoin his father and the family in Missouri. There he met a French immigrant 10 years his junior. Nicholas Earp had become the Justice of the Peace in Lamar. He officiated the ceremony between Virgil Earp and 17 year-old Rosella Dragoo on May 30, 1870. There's no further word of Rosella. It's possible her parents objected to the marriage. It may have been annulled. Or it could be she succumbed to a deadly illness of the day. We don't really know, as no further records citing her have been located. In the 1870s, Virgil left Lamar MO. He ended up in Council Bluffs Iowa. There he met a waitress named Alvira Packingham Sullivan. She was called "Allie." It seemed they were meant to be - they stayed together for life. Allie was born in 1874 in Florence Nebraska. She was 25 when Virgil came to town, and they met. Soon they began traveling around together.11 Around mid 1876 they were in Dodge City Kansas. Wyatt Earp was in town there, as an assistant Marshall. Virgil went to hook up with Wyatt, touch base with him. The Earp brothers often tried to stay near each other. Virgil was deputized by Wyatt there for a short time. Virgil Earp moved with Allie to the Village of Prescott AZ in July 1877.9 He worked a few jobs while living there. He got a job as a mail carrier, and then worked in a sawmill. An incident in town gave Virgil an opportunity to be immediately deputized as a lawman. As a result of this incident, Virgil became well known in the village of Prescott. In early March 1878, the Village Council met. They gave Virgil a position of authority, verging on a law enforcer - as their Night Watchman. Patterson, Caldwell & Levally, a Prescott freight company also offered him a job as a driver. He took them up on that, and made stagecoach runs for them. This job enabled his meeting Arizona Territory Secretary of State, John J. Gosper. Another notable passenger was Crawley P. Dake.11 These meetings eventually would bring him to Tombstone AZ. On November 1, 1878, Virgil Earp announced his candidacy for Prescott Village Constable. It was noted in the local paper. The Arizona Weekly Miner of Prescott supported his election. The results of the election were published on November 8, 1878. Three men ran for Constable. Virgil Earp beat the closest competitor by just over 100 votes. He then resigned his position as the Night Watchman, and the town Council appointed a new one. Virgil and Allie seemed to be settling in to their life in Prescott Arizona. Virgil Earp's brothers were scattered about the West at the end of 1878. They wrote to each other, discussing possibilities as the year 1879 progressed. Virgil had noted the action in Tombstone, Arizona - the discovery of silver. This new southern Arizona town was on the move! Virgil faced a Grand Jury investigation of charges from someone named Roggen on June 25, 1879. It was dismissed in November of that year. On October 3, 1879 Frank Schultz accused Virgil of assault. Virgil informed his brothers he was prepared to move to Tombstone AZ. James and his wife Bessie came to Virgil's home. Also arriving there that autumn were Wyatt with Mattie Blaylock, and Doc Holliday with Big Nose Kate. All the brothers looked forward to new opportunities in Tombstone. Virgil Earp accepted the appointment for the position of Deputy U.S. Marshal on November 27, 1879. In an interview, Virgil himself said, "I went from Prescott to Tombstone as Deputy United States Marshal. "9 All the group left Prescott and arrived in Tombstone the first part of December. Only Doc Holliday and Big Nose Kate did not travel with them. They stayed behind at that time for local gambling opportunity. B & B on the Corner Where Virgil's House Stood. SIDE NOTE - Virgil & Allie's original house burned down. This current bed & breakfast was built using reclaimed wood from their house. It was to help keep some historical value. This B & B stands on the original lot where historically Virgil & Allie lived. Virgil and Allie found a house on the Southwest corner of Fremont and 1st Street. Wyatt found a location just down from them, slightly West [Read More>]. Virgil busied himself getting settled in town. Dake had asked him to handle problems with marauding cow-boys in the area. In the late 1800s the word "cow-boy" applied to ranch hands who roamed the range. They grabbed cattle, especially those nearby, and just across the border. They were accused of changing brands and then selling them. Virgil anticipated working to solve this problem. But Virgil wasn't paid very well. Officially, he was called on intermittently to help county and city administrators. An incident in late October, 1880 led Virgil to try to expand his law opportunity. City Marshal Fred White was shot by Curly Bill Brocius. White admitted before he died that it was accidental. He expired a few days later from his gut wound. Virgil was immediately appointed to fill in as the acting Tombstone City Marshal. This was a much better financial position for him.13 Virgil decided to run for the office. They held a special election on November 13th. Ben Sippy was his opponent. Virgil lost by 52 votes. Although Sippy won, 7 months later he requested a Leave of Absence. It was suspicious that he never returned! Hmmm - it was found he left some fishy financial circumstances behind. Virgil's first actions were investigating stage robberies. One in particular happened on March 15, 1881. A well-known freight employee and a passenger were shot dead. Plus the strong-box was stolen. In April of 1881, Tombstone city fathers enacted a new ordinance. It prohibited deadly weapons in town, unless you were a law officer. To be fair the original law was a little confusing. It was difficult to enforce the way it was written, and not particularly popular. That was one contributing factor to the enmity between the Earps and the area cow-boys. When in town, various groups of cow-boys often had conflicts with the law. They were blowing off steam, drinking heavily. Behavior like that can irritate some citizens - and law enforcement. The Earps became well known to some of the cow-boys, and vice-versa. In late October of 1881, the irritation between these two factions headed to a deadly duel. Cow-boys Tom McLaury and Ike Clanton came into town on Tuesday, October 25, 1881. They needed to take care of some errands. Afterward they wanted to stay over, have a meal, gamble and drink. They got a room at the Grand Hotel. Recently when talkative Ike was in town, he'd been grumbling about his dislike of the Earps. That included this day. In fact, the more he drank, the more intense his complaints became. That evening Ike went to a saloon to gamble and drink. Wyatt, Morgan and Virgil Earp, plus Doc Holliday came in. Doc began an argument with Ike. Doc told Ike to go get armed, since he wasn't. The Earps broke up the fight, and Wyatt took Doc back to his room at Fly's Photography Studio. An odd combination of men started a poker game - Ike Clanton, Virgil Earp, Tom McLaury, John Behan, and one other guy. They played all night, until about 7 in the morning. As Virgil was leaving Ike told him that Doc was going to have to fight. Virgil had been trying to keep things calm in most interactions. He was always the one who tried reasoning as a first tactic.11 As Virgil headed home to get some sleep, Ike was still irate. He said to Virgil how he aimed to kill Doc Holliday. Virgil felt it was just drunk talk. He told him to go home to sleep it off. That he didn't want to hear anymore talk like that, after all he was the law. But Ike didn't stop. He continued around town, barking his dislike of the Earps and Doc Holliday. Lots of town-folk heard his rantings, his threats against their lives. When Virgil woke up, he heard from friends about Ike's actions. He felt it necessary to find him, be sure he wasn't armed, and disarm him if needed. Eventually Wyatt, Morgan and Virgil Earp encountered the Clantons and McLaury brothers. They all gathered in a vacant lot next to the O.K. Corral. Historical accounts are unsure who began the shooting. But it was all over very quickly. Ike Clanton ran off and was unharmed. But his brother Billy was dead. The McLaurys were dead. Wyatt was not hit. Doc Holliday was barely grazed. Morgan was shot into his shoulder and upper back. Virgil got it in his upper leg. It was all over with 3 dead and 3 injured in a matter of less than a minute. While Virgil was recuperating, Ike Clanton filed murder charges against him, Wyatt, Morgan and Doc. Wyatt and Doc were jailed, Virgil was suspended as Police Chief. The initial hearing by Judge Spicer determined the Earps and Holliday acted justifiably within the law, if maybe unwisely. In two more weeks a grand jury gave a similar outcome. They dropped the charges against Virgil Earp, his brothers Wyatt and Morgan, and on Doc Holliday. Judge Spicer received an anonymous threatening letter. He responded to the threat with a letter in the Tombstone Epitaph. The Epitaph's editor, John Clum, was then shot at by some unknown person! Virgil was in the Oriental Saloon that evening. A heated discussion developed between Oriental manager, Milton Joyce and Virgil. Joyce had worked together with the Earps before. Especially with Wyatt. But he definitely didn't like Doc Holliday. Lately he'd had some touchy situations with the Earp group. The Earps knew the dislike they felt throughout town had heightened. Plus the danger to their lives had increased. They moved from their homes into the Cosmopolitan Hotel. On December 28, 1881, Virgil Earp was walking home on Allen Street. He was between the Oriental and the Crystal Palace Saloons. Shots rang out, coming from a second story area which was being constructed. This was above the Bucket of Blood Saloon (present day: Longhorn Restaurant). Virgil was hit by the gunfire, which severely injured his left arm. On March 18, 1882 Morgan and Wyatt Earp went for a game of pool at Campbell & Hatch's on Allen Street. Two bullets sped through the back door from an alley. The first bullet hit Morgan - a fatal shot. The second shot came close to Wyatt's head, but missed and entered a wall. Dr. Goodfellow, an expert at treating gunshot wounds was called for immediately. Despite his expertise, Morgan's wounding was very severe. He died a little later, with family members by his side. Morgan's body was shipped back to Colton California. Virgil and Allie knew it was time to leave town. They accompanied the remaining Earp women and boarded the train to Colton. Their next move was to San Luis Obispo, North - near the coast. Virgil and Allie were following horse racing. He began placing bets at the track there.11 It wasn't as good as they thought it would be - so they moved on. Cripple Creek Mining Exchange in Portland Hotel In 1895 - Already Busy Enough! Wyatt and his wife Josie were headed to the gold-mining town, Cripple Creek Colorado. Virgil and Allie headed there to meet up with them. They planned to open a saloon. But Cripple Creek had already met its hey-day and was booming. It had many saloons already. Did it need another? No!11 Virgil soon realized this. So he took Allie and they left to move to Arizona again. They remembered how they had liked it there. Virgil and Allie went to the town they'd first resided in - Prescott, AZ. They settled on a ranch in Kirkland Valley, south of town.1 This time Virgil thought he'd try mining. In late 1898 Virgil received a letter in the mail. It came from Oregon. It was from a woman who'd read in newspapers about the O.K. Corral shootout. Of course it mentioned Virgil Earp, and stated his current location. Virgil and Allie were amazed and thrilled! They began a correspondence. Nellie Jane planned a trip to visit them in Arizona. But her daughter came down with pneumonia, which made the trip impossible. Virgil often returned to Colton to visit his family. He began to sell his farm animals in 1902. He had property in the area which he also began to sell off.11 He probably thought of returning to Colton to live. Why Goldfield now? 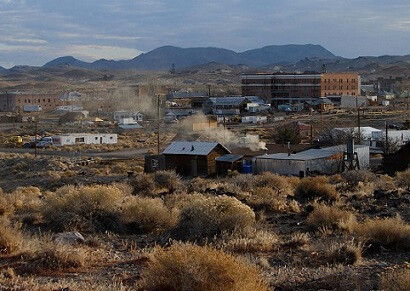 A new, booming gold-mining town. Virgil Earp was in no shape at this time in his life to go into mining. He didn't have much in extra funds for investment into a business venture. He had his reliable pension. Allie could earn some money with her sewing. He got a job as an enforcer - some called the position a special officer. Maybe it was a bouncer, really, at a local casino in town - the National Club.11 It kind of related to his prior law positions, if you want to stretch it. After all, he wasn't in the best shape of his life - with all of his injuries. It was a limited area to cover. Allie sent a telegram to inform Virgil's daughter, Nellie Jane. She said her father had passed on. She advised that if she wanted to have him she needed to act fast, because Wyatt aimed to claim his body. As a lawman Virgil Earp normally tried reason first, then went to force only when necessary. He used deadly action only as a last resort. Through the years many people commented on his personality. They usually had kind or admirable things to say about him. In the Tombstone area, many still held bitter opinions of the Earps, including Virgil. In the present day, it's difficult to know how to judge someone who has been dead many years. There are always two sides to a story. We can be sure Virgil Earp had some faults. Yet, he was probably trying to do the best he could in law enforcement. Everyone who reads his story, and studies his history will have to make their own conclusions. 3 Friedman, R. (1997). Tracking down Oregon. Caldwell, ID: The Caxton Printers Ltd.
7 Clavin, T. (2017). Dodge City: Wyatt Earp, Bat Masterson, and the wickedest town in the American West. New York: St. Martin's Press. 11 Charles River Editors (n.d.) Legends of the West: Virgil Earp and Morgan Earp. Harvard and MIT Alumni. 12 Ball, L. D. (Autumn 1973). Pioneer Lawman: Crawley P. Dake and law enforcement on the Southwestern frontier. The Journal of Arizona History. Arizona Historical Society. 14 (3), pp 243–256. JSTOR 41695121. 13 Marks, P. M. (1996). And die in the West: The story of O.K. Corral gunfight. Norman, OK: University of Oklahoma Press. ISBN 978-0-8061-2888-7. 16 The Weekly Arizona Miner (1880, July 30). The Chinese Must Go, p3; Prescott AZ. 17 Williams, R. & Courtney, B. (2019, March 7). Event Lecture: Virgil Earp: Toughest of the Earps? Schieffelin Hall, Tombstone AZ.